She may be the most famous reality show star in the U.S., but Kim Kardashian looked more like a glamorous old-time Hollywood movie actress as she stepped out of her New York apartment today. The 30-year-old wore a one-shouldered petrol blue Vera Wang gown, with her long dark hair coiled in a chic plaited updo. Bright red lips, grey and black platform heels and Loren jewels completed the glamorous look, which Kim clearly loved. The star wore the stunning ensemble to the Vera Wang 2012 spring collection show at New York Fashion Week. Wang designed Kim's wedding dress for her recent nuptials to Kris Humphries. The star looked intensely focussed on the designs on show from her seat in the front row alongside designer Rachel Roy. She was in star studded company with Beyonce sitting a few seats down from her. Later that day Kim slipped into a canary yellow dress to enjoy lunch with her friend. Yesterday saw Kim at another fashion event, cheering on her younger half sister Kylie as she made her catwalk début for Avril Lavigne's fashion show. She sat in the front row alongside 15-year-old younger half sister Kendall, sister Kourtney and step brother Brody Jenner, who is dating Avril. 'Just left @AvrilLavigne's fashion show w my lil sis @KylieJenner walking in it! She was so fab!' she tweeted after the show. Kim is back in the Big Apple to film the second series of she and sister Kourtney's spin-off show Kourtney & Kim Take New York. Meanwhile, while Kim glammed it up at The Lincoln Centre today, her new husband Kris was spending a more casual day out. 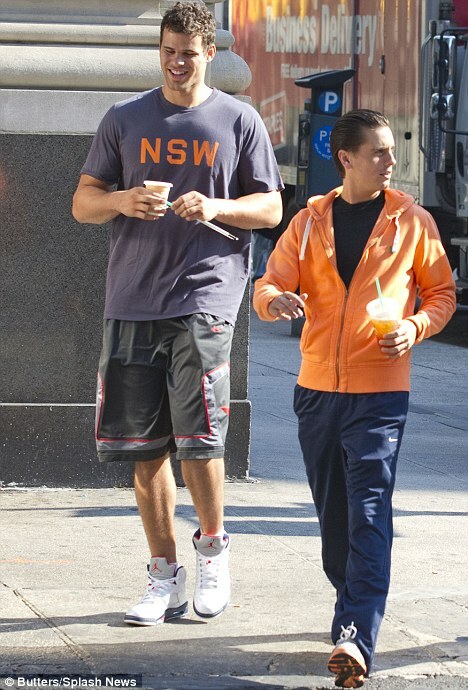 The basketball player star wore a T shirt, long baggy shorts and trainers as he stopped off at Starbucks with Kourtney's boyfriend Scott Disick.